Can I just say that blogfests are the best? I should really host my own sometime... anyway, I saw this one on a couple of blogs and I just had to join in. It is that fun. 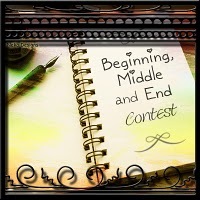 For all the info hop on over to Kate Larkindale's blog. Here is the beginning, middle, and end to Earth Song. And yes, the end is a cliffhanger. Let me know what you think...? I could die if I am caught here; die on my own land. I close my eyes and see that I am surrounded by archers on all sides. If I do not move I will die. It is not long enough for me to find my horse, but it is long enough for me to save my own life. It is time for our generation to stand; time for the magic to return and the tyranny to end. It is now or never. See now I just want to it to be now, not never because I want to know how your MC saves their life, not once but twice! Love it! Kind of creepy how the paragraphs all coincide with each other on yours! I vote you win! Ooh, I *love* this! Very, very intriguing with a powerful and hopeful end. Great job! Wow! Yours all kind of make sense. I guess that's a sign of a cohesive novel, huh? Great stuff! Someone was listening in the 'hook your readers with the first line' class :-) Very nice! Nice teaser. I'm totally intrigued. And you can host your own blogfest! August is the month for blogfests it would seem. September looks really busy too. I love it! It sounds very intriguing! :) You should totally host your own blogfest. That would be awesome! Blog fests are so fun though - aren't they! What a great idea and an excellent delivery! This grabbed me at the start, beautiful writing! sorry about that. I never got a chance to submit. With the power out change of school schedule and working on generators and stuff I never had time. Hope it went well. those are some great lines! Oh, my gosh. I LOVE IT! Like really love it. Wow, your lines are really arresting. I love that even with only these little glimpses, I get such a sense of the plot and the stakes. It makes me feel like your story is well-focused and action-packed. I liked the middle and end part. Ahhh!!!... When's your book finally gonna be out in the market?!! Whoa, that is a possibly very special exercise. In my experience, writing down those parts result in one of two things: relief or panic. It's a good exercise though, and I like yours, especially the cliffhanger part :) though I am not a big fan of cliffhangers generally.